Brown Landone was an Influential New Thought and metaphysical Leader. Dr. Landone was also prolific writer, authoring more than 100 books, covering such subjects as Leadership, Civilization, Peace and Religion. Brown Landone was born on the High Seas, on an American ship. His parents were both British by both. The family was somewhat wealthy and resided in Philadelphia for much of Landone's young life. Brown Landone was also sickly as a child and had to be nursed through one illness after another. Due to his fragile health, Brown Landone lived his usual routine life as an invalid. He had full-time nurses that had to assist him with even the most minor tasks, such as dressing or bathing. But when Landone was thirteen, an event would occur that would result in a change in the way he thought forever. One day, when he and a nurse were alone in the house, the nurse discovered that a bottle of the boy's special medicine was empty. She informed Landone that she would need to go to the drugstore to get more. Shortly after the nurse had departed, Brown bgan to smell smoke and knew that something was on fire. He remembered that his father had instructed the servants concerning one important thing they must to in case there was ever a house fire. He had told them that there was a metal chest in the attic that contained every valuable paper he possessed, and that they were to retrieve it in such an incident. As Brown Landone smelled smoke, he could think of nothing else but the chest and his father's request. He was not aware of the events that followed, but had later found himself suddenly standing on the sidewalk beside the precious box. Landone, a supposed invalid, had retrieved the heavy chest from the attic and carried it to the sidewalk. Landone had fainted the moment he realized that he preformed such a task in his condition. The fire was estinguised without any great harm, and the nurses guided Landone back into his bed. But he told the nurse that he refused to go, and wanted to sit in a chair and simply 'think'. Years later, Brown Landone recalled how he had preformed an extraordinary feat without any conscious awareness of it. He realized that if he could do that subconsciously when he was ill, that he could certainly do in consciously. After the incident, Brown decided for himself that he would no longer be bedridden, and from that day forward he never was. His health was restored through faith in the power of his own mind. Before Landone bagan his work within the New Thought movement, he had been a medical doctor. He had also been writing and lecturing for several years. Early in his life, Landone had been educated by private tutors in American, England and France. He also studied for the ministry at the Episcopal High Church in England and received his Doctorate of Divinity degree. He also received a degree in medicine, and throughout his practice of medicine he learned that subconscious suggestion did more for the patients than medicine. Landone bacame known as one of the first neurologists (later called psychiatrists), through his work in localization of brain centers. In 1985 he organized the first boys' activities in the Y.M.C.A. At one time, he was also sent to Germany to make economic survey of the then German Empire which he copleted early in 1914. During World War One, the President of France appointed Dr. Landone special ambassador for France to the United States. Around this time, he was also consultant to sales managers of Ford Motor Company, U.S. Steel, and Metropolitan Life. Dr. Landone had three sons, all of whom died in the war. This resulted in his interest in the promotion of Peace. He was an instrumental figure in forming a European Peace Foundation. For many years, Landone lectured regularly in New York City. The headquarters for Landone's office was in Newton, New Jersey, but later he relocated to Winter Park, Florida, where he maintained a large office staff and issues his publications from his home. Brown Landone's interests were wide spread. In 1930, when silent movies were changing to talking movies, he was called to Hollywood to help fit the voice to microphone and the microphone to voice. He also carried on many experiements with an Asian Shrub called Ramie, a fiber used in textiles. He held demonstrations from his home and people from all over the United States attended. Brown also founded "The Landone Foundation" and conducted an experimental farm in Zellwood where he successfully grew Ramie in large quantities. Landone was well known for his scientific research and his work in metaphysics. Through the years, he became the close friend of many great artists, writers, international celebrities, and spoke before almost all the Civic Groups and clubs of America at the time. The major theme of his teaching had been to be every conscious of new ideas, and to express them in love for the good of all. 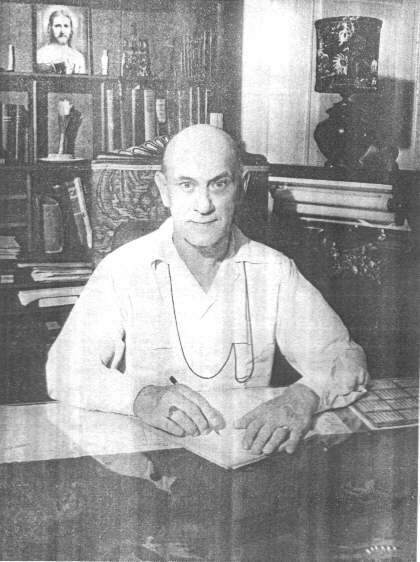 In June of 1940, Brown Landone started a column in the Winter Park Herald called "The Voice of the World", (later changed to "This Changing World"). The last printed article of the column appeared nine days following his death on October 19th. Brown Landone was an active worker in the New Thought Alliance since its early beginning, and almost every international Congress program bears his name. He always attracted huge audienced to his Congress lectures. He served several terms on the Executive Board of the INTA, and also as District President for the States of New York, New Jersy, and Florida. Brown Landone lived a fruitful life and impressed many with the quantity and quality of his work. He was one of the most outstanding teachers of the New Thought Movement, and had one of the largest personal followings of any teacher in the movement at the time.